The report compiled by Persistence Market Research provides key insights on the global compounding pharmacies market for the period 2017 - 2025. The main objective of the report is to offer in-depth analysis on both quantitative and qualitative factors, along with the information on growth opportunities in the global market for compounding pharmacies. The report focuses on the compounded drugs including customized medicines provided by a pharmacist or a physician. These medicines are available in strengths that are not commercially available. An increase in the number of dispensed prescriptions globally is leading to the significant growth of the compounding pharmacies industry. People across regions are suffering from diseases that require specialized formulations. Hence, compounding pharmacies are working on introducing new formulations effective in treating various diseases. However, hiring specialized workforce consisting of pharmacist and lab technicians is one of the biggest challenges being faced by the compounding pharmacies. The companies operating as compounding pharmacists are also supplying customized drugs to the patients who are not able to get results by consuming commercially available drugs. Also, compounding pharmacies are efficiently manufacturing drugs in a sterile environment. This, during the time of shortage, will boost the supply contracts of compounding pharmacies with healthcare providers. New regulations are also being introduced in the compounding pharmacies industry worldwide to deal with the problem of contaminated drugs and wrong formulations. Increasing number of patients visiting physicians to address chronic illness is resulting in the increasing consumption of prescribed medicines, thus, fueling the global compounding pharmacies market. According to the report by Persistence Market Research, the global market for compounding pharmacies is anticipated to witness a significant growth throughout the forecast period 2017-2025. 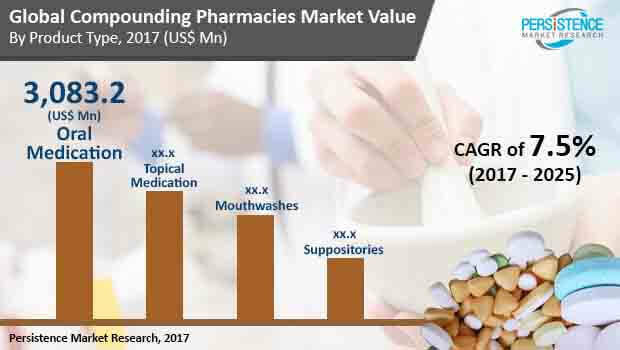 By the end of the forecast period, the global compounding pharmacies market is estimated to bring in US$ 13,366.5 Million revenue. Hospitals and other healthcare providers are encouraging patients to purchase compounded drugs. In the global market for compounding pharmacies, oral medication compared to the topical medication is likely to account for the highest sales during 2017-2025. In oral medication, capsules, mixtures, lozenges, tablets, and lollipops will witness substantial growth in the coming years. Increasing number of patients prefer medicines through the oral route, this is likely to drive the demand for oral compounded prescribed medication. However, the rise in drug failure rate during the drug discovery and formulation process is expected to hamper the market growth for oral medication. Companies are also hiring and providing training to the pharmacist to mix ingredients and create a perfect medication prescribed to the individual patient. Moreover, oral medication is convenient, economical, the oral route is safe as it is non-invasive, and administration of oral routes require no special training. However, oral medication has increased risk of drug-food, and drug-drug interaction which can adversely affect the health of the patient. Compounded hormone replacement therapy is gaining popularity in restoring and balancing hormones in the body. Compounding or creation of drugs meeting specialized needs of individual patients is on a rise. In the recent years, increasing number of people have shown a positive attitude towards hormone replacement therapy. This is driving the demand for compounded drugs in hormone replacement therapy. Research activities are also being conducted to discover the most effective delivery method of compounded drugs for patients undergoing hormone replacement therapy to avoid certain risks. Hormone replacement therapy is being prescribed to treat various conditions, especially in women including pre-menstrual syndrome, weight gain, irregular menstrual cycle, and other conditions. The biggest advantage of compounded hormone replacement therapy is that it can fit each individual’s hormone levels and body. B. Braun Melsungen AG Company.